Is there anything better then receiving a huge package in the mail, opening it up, and finding fresh produce inside? Not much! I love getting things in the mail and fresh produce is one of my favorite things because I often get things that I can’t get in my local grocery store and it’s fun to cook and bake with it. Of course we also eat a ton of fruit in this house because it’s J’s favorite thing to eat. I already knew what produce was coming from Melissa’s Produce so I set about trying to figure out what I wanted to make once it arrived. The obvious thing to make was something with the Meyer Lemons and Key Limes. Everyone knows that lemon and lime pairs well together but that seemed too obvious. I wanted to make something a little different. I started going back and forth on ideas with my brother. We have fun talking about food so we came up with a few ideas. I asked what he thought about key limes and blood oranges and we both agreed that in the right recipe it would totally work. After all, they are both citrus fruits. When thinking about this combination I realized I had made a Blood Orange Margarita several years ago that was fantastic. 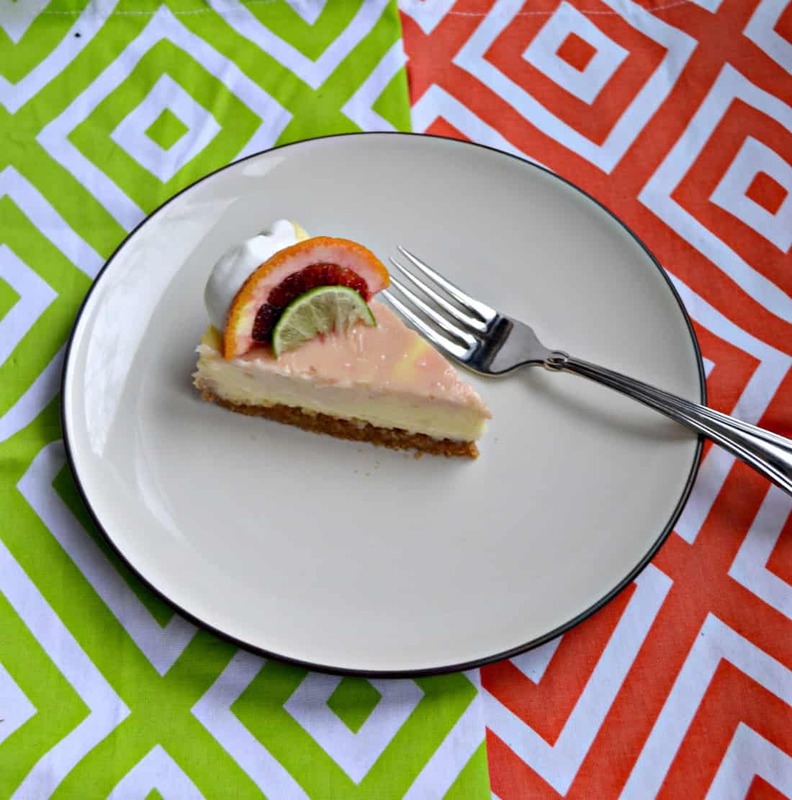 I used that as my inspiration for this Blood Orange Margarita Cheesecake. I made a tasty graham cracker crust and then used my classic cheesecake recipe. To flavor the cheesecake I divided the batter and then added blood orange juice, zest, and orange liquor to one portion and key lime juice, zest, and tequila to the other portion. 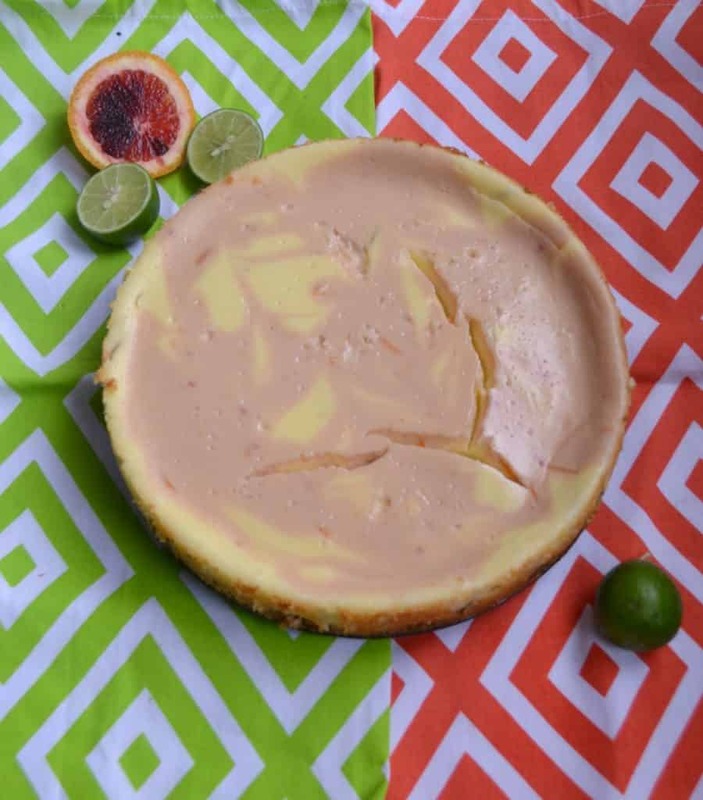 I poured the lime cheesecake into the pan then dotted it with the blood orange cheesecake. A butter knife swirled the two together in a fun and pretty pattern. While my cheesecake cracked as it cooled it still looked great. I was so excited to try it and I wasn’t disappointed. 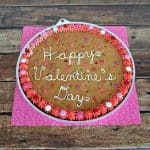 The crust was crisp and buttery while the filling was creamy and flavorful. I could clearly taste the blood orange and the key lime and the combination was perfection. 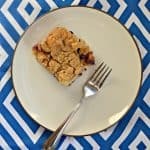 It was just a bit tart which worked really well with the sweet crust. I don’t know about you but I love a sweet and tart combination. So if you are looking for a fresh and tasty dessert give this Blood Orange Margarita Cheesecake a try and serve it with my Blood Orange Margarita for the ultimate dessert pairing! A delicious key lime margarita cheesecake swirled with blood orange cheesecake all in a graham cracker crust. Combine the graham cracker crumbs, sugar, butter, and salt in a food processor and process until a mixture forms. Press the graham cracker mixture into the bottom of a 9 inch springform pan. Bake for 10 minutes then remove from oven. Meanwhile, place the cream cheese, sugar, and eggs in a large bowl. 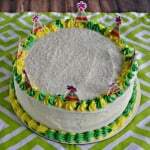 Use a hand mixer on medium speed and beat until smooth. 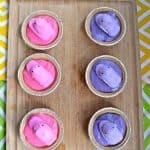 Remove 1 cup of batter from the bowl and place in a medium size bowl. In the large bowl add the key lime zest, key lime juice, and tequil and mix well. Pour over top of the graham cracker crust. Add the blood orange zest, blood orange juice, and orange liquor to the medium bowl with the small amount of cheesecake batter. Mix well. 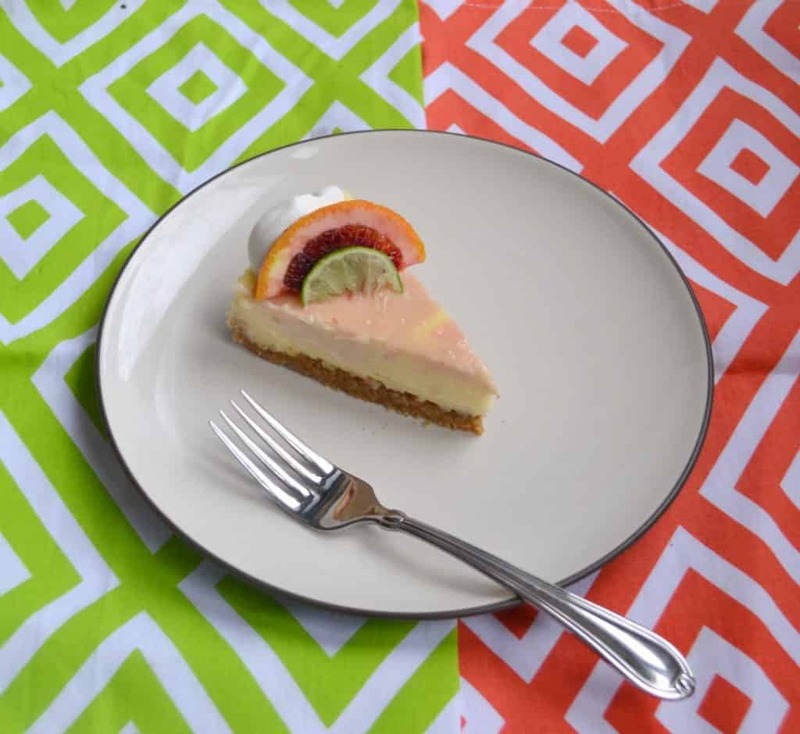 Drop the blood orange cheesecake by tablespoon on top of the lime cheesecake. Use a butter knife and swirl the batters together. Place a large, shallow pan of water in the bottom of your oven and then put the cheesecake on the top rack. Bake for 50-55 minutes or until the center looks set. Remove from oven and sprinkle with sea salt. Allow to cool completely (about 2 hours). Once cool refrigerate until ready to serve or for at least 2 hours. This sounds so good. 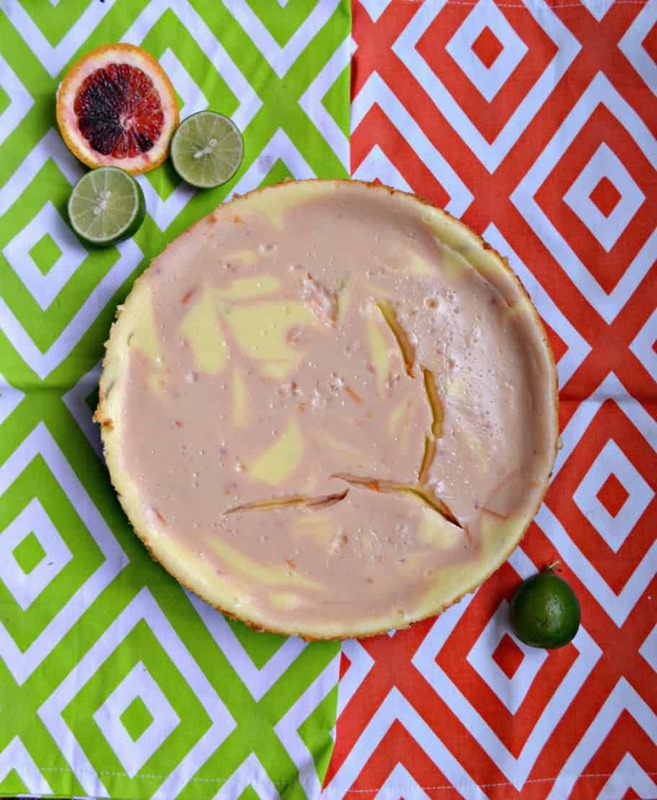 I love blood oranges and cheesecake so together it’s “boosh” mind blown! I am so inspired by all the cheesecake recipes this week. This one looks and sounds oh so delicious. Who cares about cracks! This sounds really good. I loved my Melissa’s Produce box. I love your flavor combo here, and it also looks GORGEOUS! Thank you! It turned out really yummy! I love the flavor of blood oranges. This looks like a decadent dessert.